An interview with Italian Car Designer and Automotive Artist Michele Leonello was both humorous and enlightening. 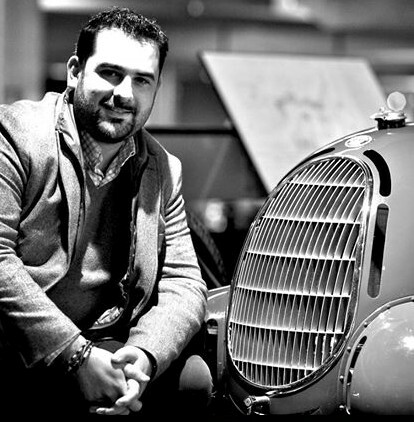 He spoke with a true Italian passion for car design. 'Understand Patience and Feed Your Passion'. Michele, I really like your style because it's a bit different. You are really into automotive art and design, correct? I am an automotive designer. 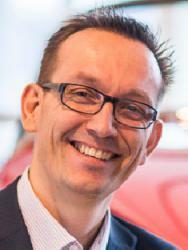 I worked many years for Alfa Romeo and Maserati. I was a designer in the design centre for Alfa Romeo in Milan. So my automotive art was really just a hobby. I went to art school and so today I can mix my experience and style of a car designer with my art and hope that I invent something different. There are a lot of super amazing artists in the world and a lot of them are my friends. I just need to grow every day. 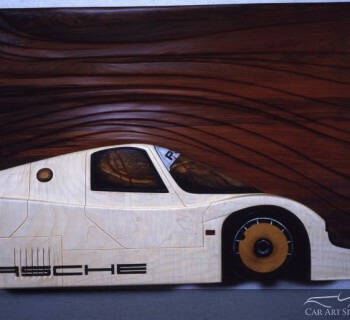 So you are making your living with automotive design and the art is a side thing? Yes, it started out as a hobby but at certain times of the year, especially in the summer and at Christmas, I receive a lot of orders from clients. So it has become a job. I recently did a water colour for a golf player from Indiana, USA. I met him in Florida. I didn't know him but he is a really famous golf trainer in the USA. I got talking to him. We had a really good chat and he asked me to play golf with him the next day. I thought he was kidding. So the next day, I did a training with him for one day in a beautiful place in Florida. I asked him how I could thank him because for me it was like a dream. He asked me what my job was and I told him I was an automotive designer. He told me his wife had a 1961 Corvette which gave me an idea. I painted a watercolour of her car and when I gave it to them, they were so excited to receive a painting of their Corvette. Many times I receive a call from someone who has a Porsche or a Ferrari and they want a painting of their car. I do a lot of commission work and much of my business comes from Alfa Romeo and Porsche owners. I did more than 200 illustrations for a Porsche book called 'Tutte Le Porsche' which came out a few weeks ago, and around 300 illustrations for an Alpha Romeo book called 'All The Cars'. For 'All The Cars' I did the inside view, scaling, drawing, digital and post production. It's a really long job. I am now working on a new book 'Old Maserati - A Centre of History' (Tutte Le Maserati). Do you use markers and the computer for your automotive illustrations? Is it a mixed technique? Both. It depends on the time I have. For example, for the Porsche and Alfa Romeo books, I had more than six months to do everything. For the Maserati, I was told to prepare the book in two months. So together with the writer, I make an historical research to find exactly the right pictures. The problem can sometimes be finding the photos, which was the case when I did the Alpha Romeo illustrations. In WW2, the Germans destroyed the Alpha Romeo factory and also a lot of their cars. So there are no pictures of some of the cars, just some sketches which were saved. So sometimes I really have to invent the car from just one old sketch. For example, last night I was working on the Maserati Royale which I think, looks more like a Bentley. It was really a huge car from Maserati. The problem is that now it is not easy to find one. There are only a few pictures on the internet. When I developed the book, I needed to check that the image I was using, had exactly the right wheels, the right corners etc and that the owner hadn´t put anything fake on the car. After we present a book, all the fans say how cool it is and how much they love it but after a few months, we receive some mails telling us that something is wrong with the car, like the colour for instance. It's really funny. I think 'come on, it's just an illustration' but the fans are sometimes very particular about this. I hear this a lot from automotive artists who get complaints about the car wheel rims or mirrors etc. Just little differences. You can never get it perfect, can you? No, because also older companies didn't used to have a car bank to find everything but they started to develop the major car bank in the 90's of styles from the 50s, 60s, and 70s. It's digitalized information but they haven't digitalized everything. Speaking of technique, if I have a lot of time, I can draw straight to the paper with the pencil, one by one. Any singular side view. After that, I play with the marker and colour with the marker etc. and then go to post production. This is the normal and general approach. Like for Maserati, I work with two different approaches depending on time. Sometimes I take the real picture of the car and the editor asks me to give it a filter effect, to transform it into a sketch. Honestly for me it's more easier to take the real picture, play with filters, add some highlights, cast shadows, put reflections on the car, and when you print it, it's impossible to say it's a picture. Everyone thinks it's a real sketch. But it depends on the timing. I need to use these tricks sometimes if I don't have much time. But normally everything is drawn by hand and I use the general approach. So there is a difference between your automotive illustrations in the books, which need to be photo realistic showing the real models, and your car art which gives you much more freedom. Correct? My automotive art gives me much more freedom than my illustrations; absolutely. Is there a difference in what you are expressing in your art? Absolutely. My art is digitalized. It is made by photo shop. I don't always like to explain my technique to my client or other people because their reaction is often that they think it is easy because it is done with a computer. I say "Okay, take the computer, download photo shop, take the tablet and show me how you do the same thing". Only people who love art are able to. I will tell you how I developed the dripping technique. A few years ago I received some commissions from a Ferrari client. This man asked me to do more than fourteen water colours of real Ferrari's which he had in his garage. I was excited because it was a big commission for me. I did all the paintings and took them to show him. He told me he didn't like them because they were boring. I asked him what he meant by boring. He said that he loved my sketching technique but said that I wasn't able to explain or transfer the same feeling on canvas that he had by touching or driving his cars. He told me I was a car designer and he expected something different from me than everyone else. There are a lot of automotive artists, many of them are my friends and I think this category is divided into two parts. Amateurs; people who work in the bank etc. and when they have time they play around and paint some amazing stuff. A lot of them are super cool artists. Then there is the category of professionals in the field, who also like to play with art but the fact is, you can recognize the car designer to the amateur who paints. This Ferrari owner told me that he wanted to see something cool; something really different. When I was back home, I was so angry because I thought I had lost all that time I had spent doing the paintings. I sat at my desk where I has some cups of dirty water colours with brushes. In pure frustration I grabbed the brushes and splashed the water all over my paintings. My wife came to me to and asked why I was destroying my paintings. By that time the water had dried on the paper and when I saw the results, I thought "WOW...... it's so cool. It looks like the car is moving". I told my wife "NO I have saved them'. So I played some more with the water and dripped some drops on the paper. My wife said it looked like a Pollock painting. I have since been to New York many times and when I get the chance, I go to the Metropolitan Museum. I have seen many of Pollocks work. Every time I imagine him pouring litres and litres of colour on the canvas. I would be really lucky if I could do the same in my apartment but my wife would kill me. I see that there are other artists who are painting in the same way as me with a similar technique. So I can't say that I am the only one, but I am different from them and it's good to be different. For example, I love Camilo Pardo. He is a Mexican American X4 auto designer. He is the father of the last Ford GT40 prototype in production. 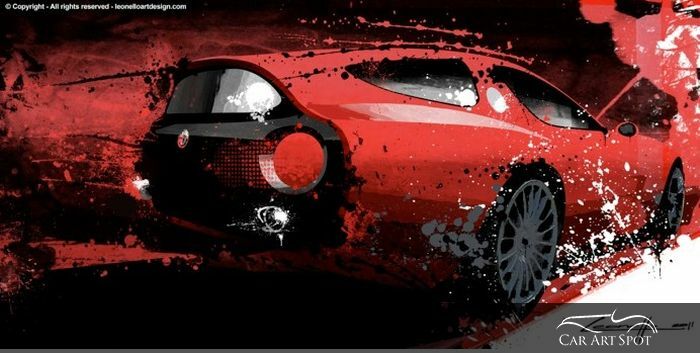 Camilo is an amazing artist and a car designer, like me. I see in his paintings how he gives feeling to the cars on his canvases. I took inspiration from his work because I love how he plays with the perspective. When I do a painting, the first thing I do is choose the right point of view to give a value and to accentuate the design of each car and the layout to emphasize more feeling. Many painters are amazing with a great technique, but I am sure a lot of them ruin their art because they don't choose the right point of view and layout. One of my mentors who I really love is Mr. Juan Carlos Ferrigno from Spain. 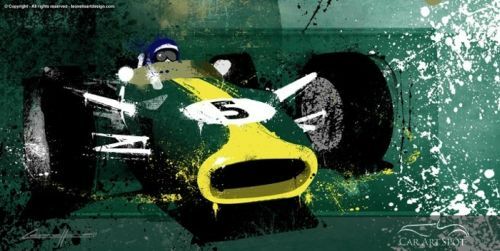 He is one of the most important automotive artists in the world and he did artwork for F1 and Motorsport. Mr. Ferrigno sometimes gives me feedback and I have received comments from all around the world about how to improve my art. Since the last couple of years, I am really satisfied with my car paintings because I have improved my technique. The work flow and how to find the right picture etc. I redraw all the pictures with photo shop and after that I play for many hours with thousands of layers to understand completely how to give this dripping effect. My partner has a factory for canvases and frames. Our relationship is that I send him my paintings and he prints on the canvas in high quality. He also gives me an area in his laboratory where I can work and put the real colour on the canvas. So when you touch the canvas, you can see that this is a mix. After that, I do the retouché. More artists combine digital reproduction and then add to it. Do you do that in limited editions or is it always one original? One original every time. I am a person who wants to do art for everybody. I don't want it to be too expensive for some people. I work with three companies. One in America, another in Switzerland who has the rights to do private projects with museums etc. and also with one of my great friends in Europe. We work very well together and have sold a lot. We decided to print some art without limits, like my Ayrton Senna paintings, Porsche and few others. In Brazil and South America, the quantity of Ayrton Senna paintings that I sold there is huge. Not only canvases, but i-phone and i-pad covers, bags etc. People there are crazy about Ayrton Senna and they love my paintings. So although I decided not to limit some paintings, 90% of my work is just the one original. Getting back to your story about your 14 Ferrari paintings, did you go back to the Ferrari owner with the changes? Yes and he said he liked them. He had invited me to visit him at his garage in the North of Italy. When I got to the address, I could only see hills. I called him and told him there was nothing in front of me except hills. He said "okay, wait a second. I will open the door". I said "are you kidding me? I am in front of hills. There is nothing here". He said "no worries" and after a second, a part of the hill just opened up like a door. It was a bunker garage. I was shocked. I never saw something like that..... never. He had invented a super cool garage inside a hill. The floor was parquet and there was a lot of scenery around from Ferrari, Shell etc. It was like being in a lunar park. It's like our best place to live and die. If I die I want my tomb inside that garage. It's the best place ever! I showed my Ferarri paintings for the second time and he looked at me and said "now it's cool". He wanted to know if he was the only one who had that type of stuff and I told him yes, you are the first one. He paid me and from that moment, I have not seen my paintings. I don't know if he put them in a frame but he was satisfied. I need to say thank you to him because he pushed me to being different. 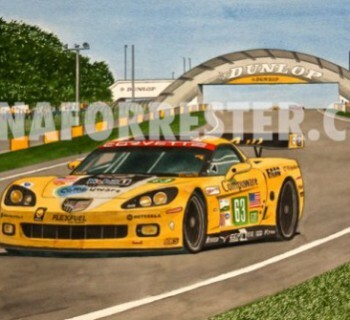 What kind of advice or suggestions do you have for young and upcoming automotive artists? It depends on your background. I grew up in Sardinia, a paradise. It wasn't easy for me to tell my family and friends that my dream was to become a car designer. It's funny though because Flavio Manzoni who is the Chief designer for Ferrari, and Donato Coco the chief designer for Lotus are Sardinians. There are many Sardinian people who had a dream to become a car designer. I am lucky because my parents gave me the chance to follow my dream. My life changed when I was eleven years old. I saw in a travel magazine some sketches which a car designer in Turin had made and on that moment I had a shock in my mind. I realized that this was my life, I wanted to do this job. My father is an amateur painter and from when I was two years old, he pushed me to draw on paper with markers, pastilles, water colours etc. There are photos of me when I was a child drawing everywhere. I was the janitors nightmare at school because they recognized my drawings of cars all over the desks. I grew up on a farm. My grandfather was a farmer, so I had sheep and cows around me. So living and playing in a beautiful place amongst nature with my friends, I had the chance to understand the details, the colour, the form and the proportion of the animals, vegetables, everything. When I started to draw, I realized that my way was not to be an artist but that I really loved to invent something. Living on the farm, I had the chance to see tractors, different machinery, touching the objects and seeing how my parents fixed situations and understood how they worked. This helped me a lot. When I understood that the automobile was my way, my family gave me the chance and put me in an art school. My family was not rich, so I never went to private school. During this period in school, some of my teachers told me that I didn't have any chance to become a designer. My father never gave any attention to their words. I am sure that there are a lot of people who never followed their dream because their parents or teachers stopped them. After that I started to study at the University for Architecture. I never finished but I have been a teacher for some years. I taught students at the Polytechnic University in Milan, one of the most important universities in italy. Also in the Domus Academy and the Politecnica Design School. I teach more than 40 students from all around the world sketching and drawing and I also follow all the projects for Lamborghini, VW, Audi Porsche, Bentley. We have some amazing collaborations with the VW group who we have been working with for more than five years. This job requires patience. It's not enough if you can design a car on paper. To be a good car designer but also a good automotive designer, it's important that you have a culture. If you don't have a culture, you are just an illustrator. 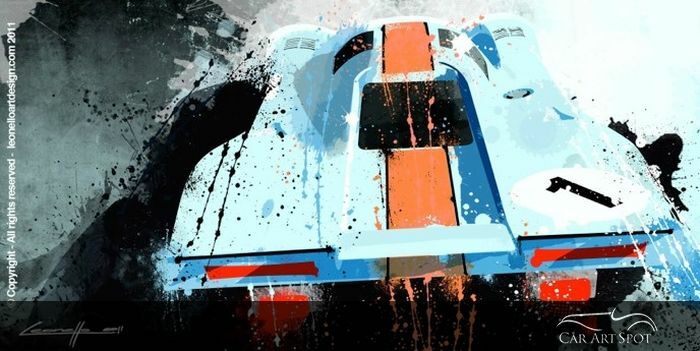 If you are painting a Porsche 917, it's important that you know the story behind the car. This makes the difference between an automotive designer and an automotive artist. Sometimes when I show my Porsche 917 paintings to people, it's mainly the fans who are the first to say that it is a Jo Siffert car. Why is this important? The car has a value in our mind, not only for Steve McQueen but because in this case Jo Siffert drove that car and won a lot of things with it. So when I teach my students, I hope that they have a bit of culture and it's beautiful to talk with them about automotives and also the history of the car and about art. Sometimes, they love my art and I ask them if they know something about the history of the car and they don't know. This makes me crazy because when I was a child, my parents bought a lot of magazines and books. I remember how many Sundays I spent watching F1 Grand Prix. Today some guys wear and speak about some brands but they don't know anything. The best advice I can give to someone is that they need to understand patience and feed their real passion. When you design a car, you need to be able to transfer your emotions and strong feelings about the car onto the paper. For myself and friends who design for sports cars like Aston, Ferrari, Maserati, Alpha etc., it's not easy because every time we have the responsibility to transfer these feelings, so that when the owner touches the car they feel the same strong emotions. It's like touching the beautiful body of a woman. When you do a automotive painting, you need to be able to transfer emotion, to show the emotion, to emphasize the car. Not only to say "it's a car, okay" but you want to feel something. When the client buys the car and spends money, he wants to be satisfied and amazed when he sees the painting for the first time. It's hard to give a good result when you have a lot of pressure on you and people waiting. So the advice is, if you want to be a good car designer or automotive artist, you need to fall in love with this job, have patience, and also a culture because it's not enough to put some lines on the paper and call yourself a car designer. I heard these words from all car designers who have had more than 30 years experience. Without patience, you can do nothing.